I have to admit that in my line of "work", I see many cars. The parade of tips that comes into our inbox is fantastic, and some of them look similar, but others are are so unique that I swear I've seen them before...and I was sure I'd seen this next feature before. 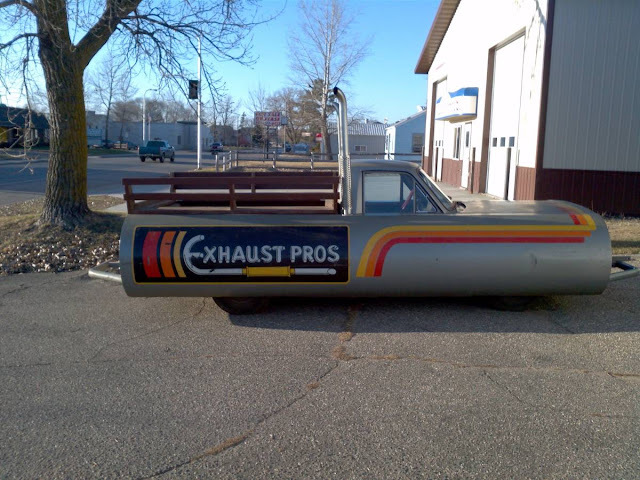 Find this 1982 Mazda B2000 Muffler Car offered for $4,800 in Ames, IA via craigslist. 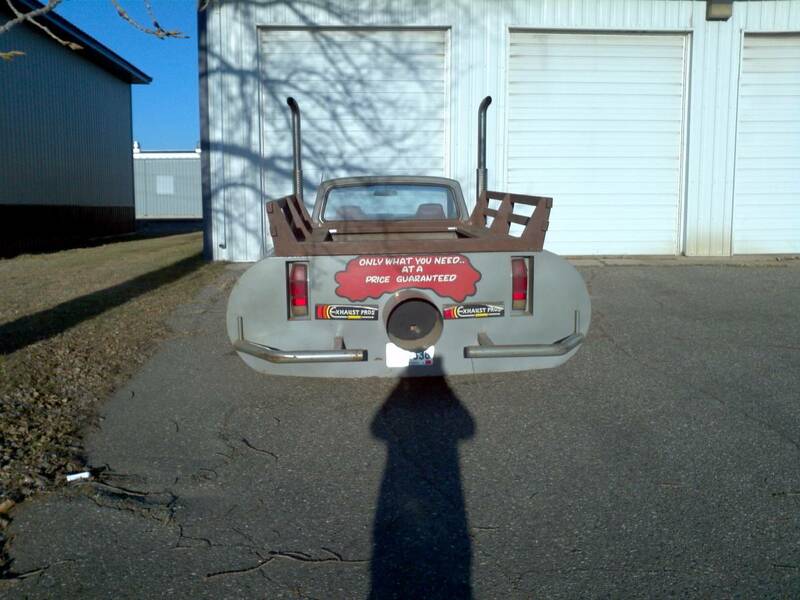 The doppelganger I was searching for was the Silence of the Cans from August of 2015 and while it is similar in concept, that was a Meineke and this is an Exhaust Pros custom. The added functionality of a pickup bed in today's custom silencer is a huge plus if you run your own exhaust shop. Even if you don't own an exhaust repair shop or some kind of parts store, you could easily justify buying this to use as a daily driver or weekend Home Depot hauler. It appears to offer most of the original functionality of the Mazda B-series pickup, but with a few feet added to each side and truck style exhaust stacks. So its an ad for a muffler shop, and it presumably has no mufflers before those stupid stacks. Yeah I know it petty but, in a POS old truck with the doors and tailgate welded shut and bumper/fake exhaust combo that would do horrible things to a pedestrian, the thing that I find lame is the bro truck stacks. They're like chrome douche flags. Sorry, rant over. Otherwise yeah if you owned a muffler shop it looks like fun. Especially cause if you own a muffler shop you could fix the exhaust so it comes out the exhaust of the big fake muffler. It just seems so obvious. Anyone else concerned with the shape and direction of the shadow in pic 2? Ha ha, so funny. That thing is huge! Searching craigslist can be exhausting! I remember seeing something like this before. 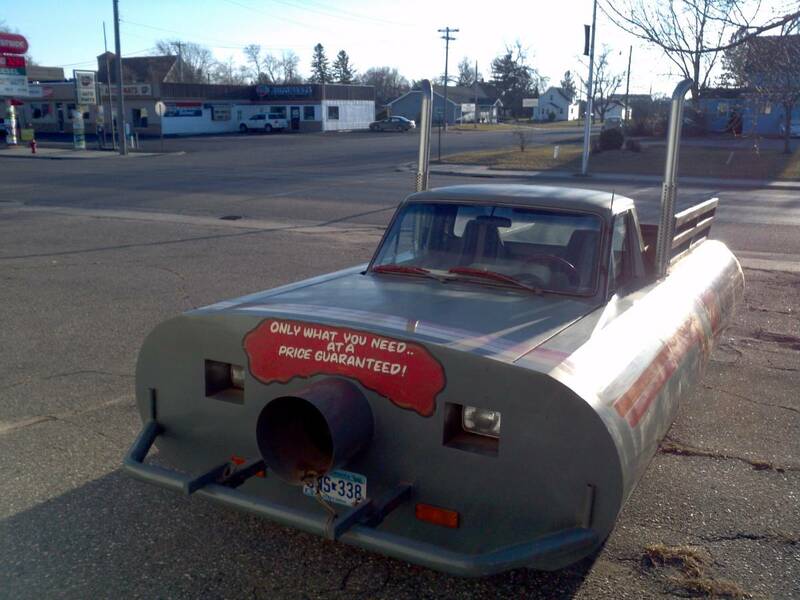 Would love to use it for some road rage demo-derby....! Not that I really need to know, but HTF does one get in an out of it? What is the weight? $4800? I will now muffle any further negative comments. This thing just leaves me baffled. You're just blowing smoke, dude.